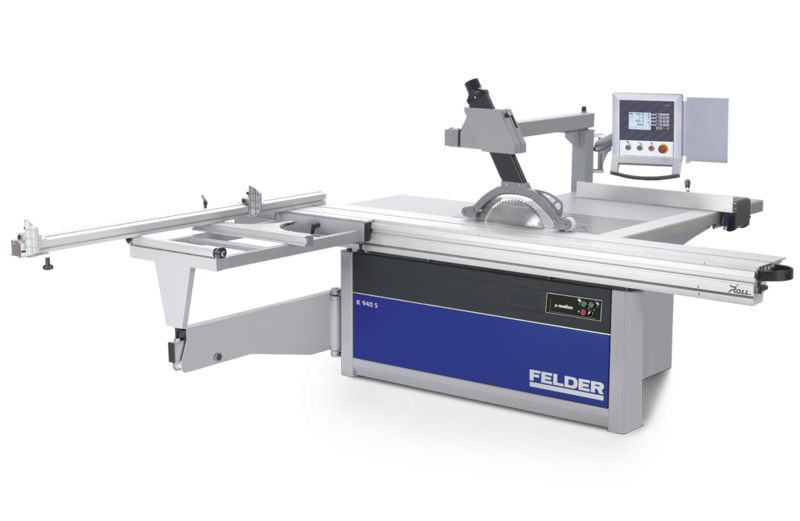 The top panel saw model from FELDER impresses with modern design, innovative operating elements, durable precision, extreme performance and maximum operating comfort. 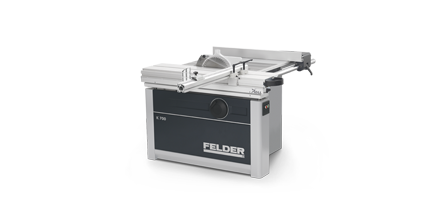 The large dimensioned saw aggregate makes it possible to use large diameter saw blades and maximum power transfer is achieved regardless which of the 3 speeds the saw is set at. 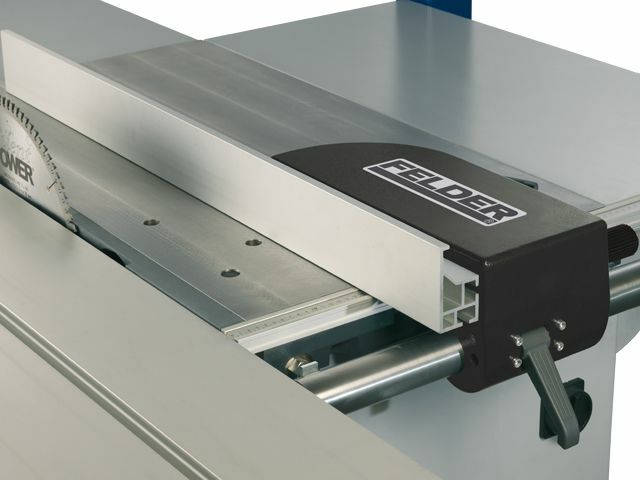 Felder system solutions such as the tilting segment guide “Easy-Glide” and the “X-Roll” sliding table with 10 year warranty, ensures reliability for years to come. 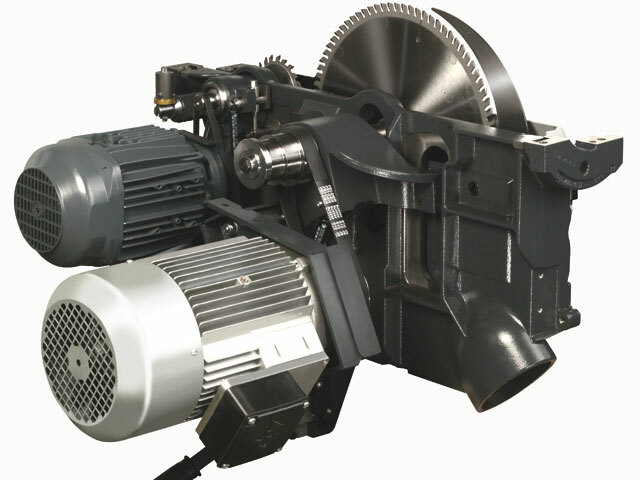 The saw arbor is enclosed in a massive­ cast iron housing. 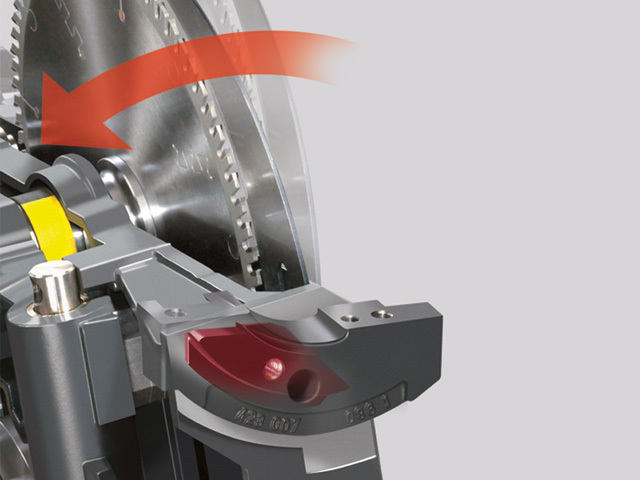 With the double bearing mounts, vibration free results are guaranteed. 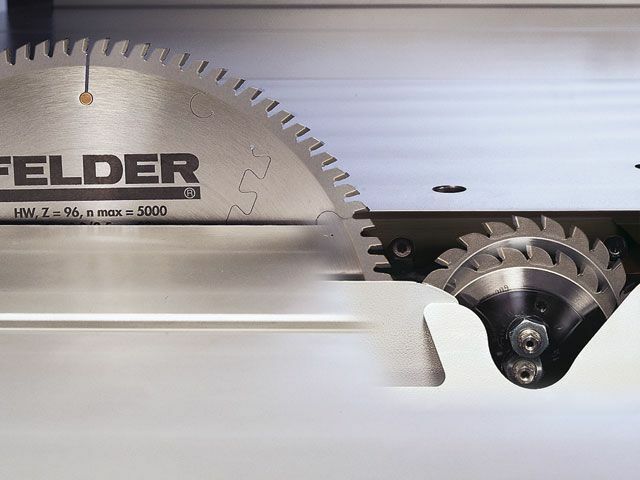 Power transfer from motor to sawblade is optimized through the use of a Poly-V belt. The new LCD touch screen and control panel are standard! 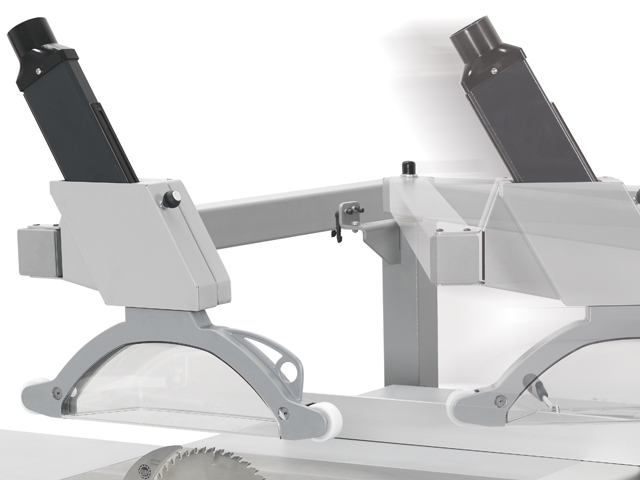 For operation of the scoring unit there are two versions available: Classic or Automatic. 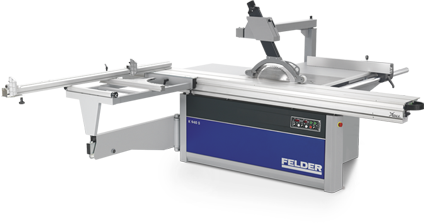 Classic: The height and lateral setting of the scoring blade is adjusted manually from the top of the saw unit table. 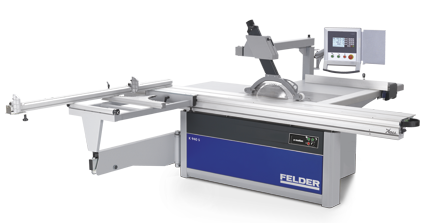 Automatic: Electric scoring sawblade height-adjustment is done easily with a switch. 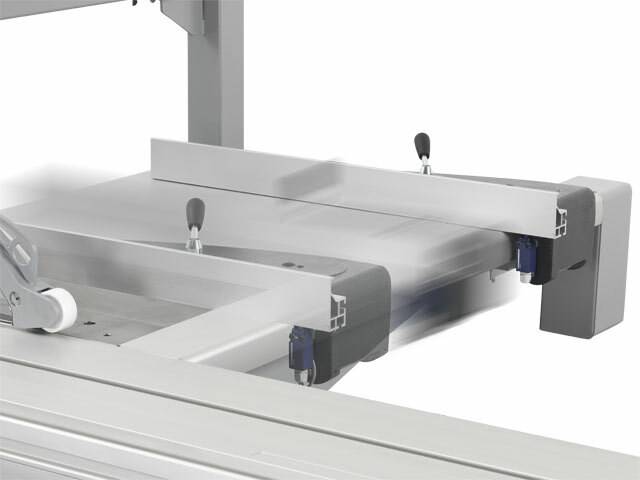 When the scoring unit is switched on, the scoring blade rises to its pre-set position automatically. 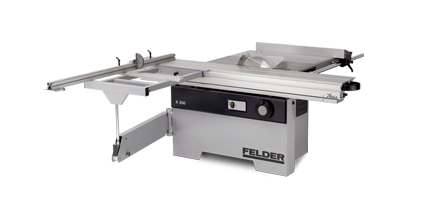 When the main blade is switched off, the scoring blade automatically sinks back under the table. This is first class comfort! 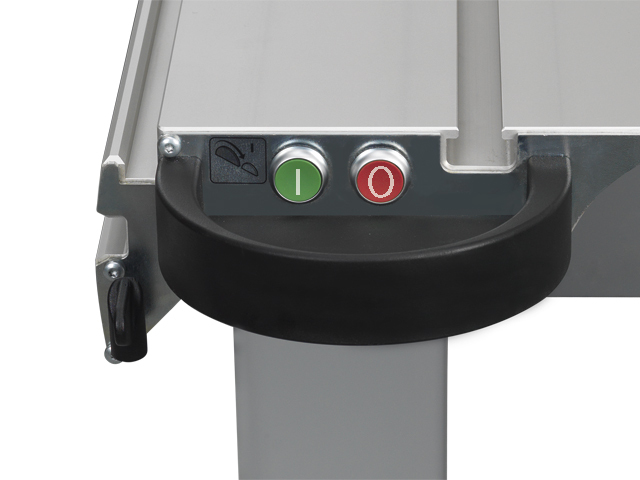 On request we can equip your “900 series” with start ­buttons for the main and scoring blades located directly on the sliding table, how about that for convenience! 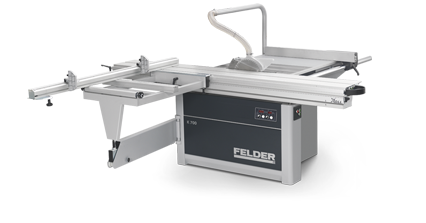 The 102” (2600 mm) long telescopic crosscut fence can be effortlessly ­adjusted from 90° to 45°. 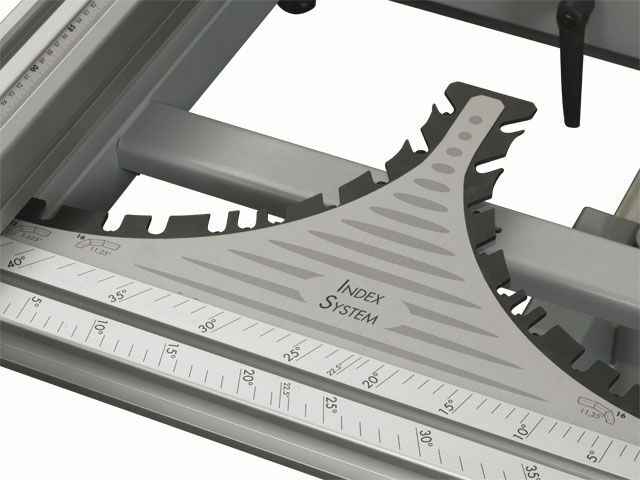 A miter scale on the outrigger table allows for accurate ­adjustments. 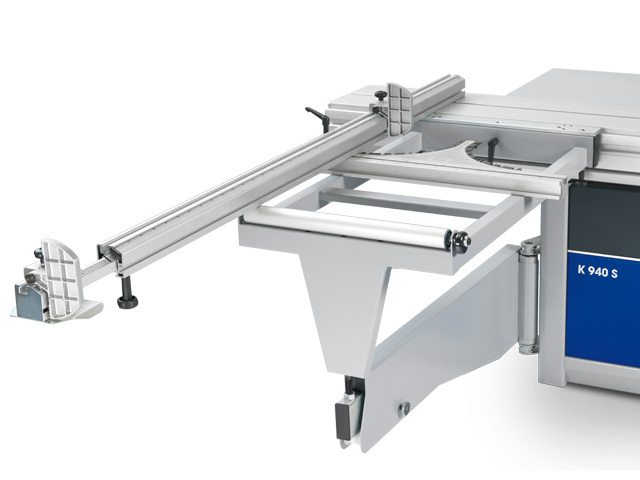 On request we will fit your outrigger table with the precision miter pin locating system, for quick repeatable accurate positioning of the miter angles. The large crosscut fence stops are constructed so that a small tongue on the stop fits perfectly into a machined groove on the fence. 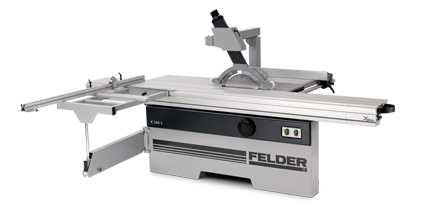 This keeps the stop firmly in place for both straight and mitered cuts. On request: the digital cross-cut stop. 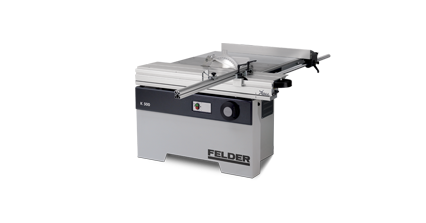 For repeatable accuracy to .001” with large LED display. 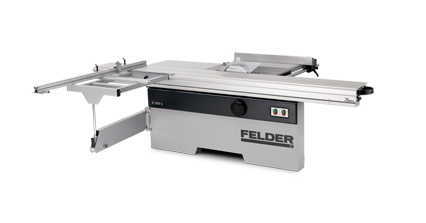 A rip capacity of 31“ (800 mm) comes standard with the option of upgrading to a rip capacity 49“ (1250 mm). 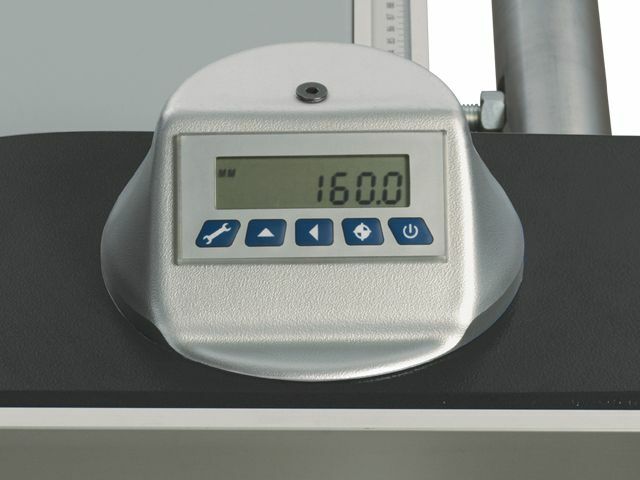 The rip scale is easy to read and perfectly integrated into the machine body. The aluminum rip fence can be adjusted along its axis to improve user comfort and safety when making repeated offcuts. 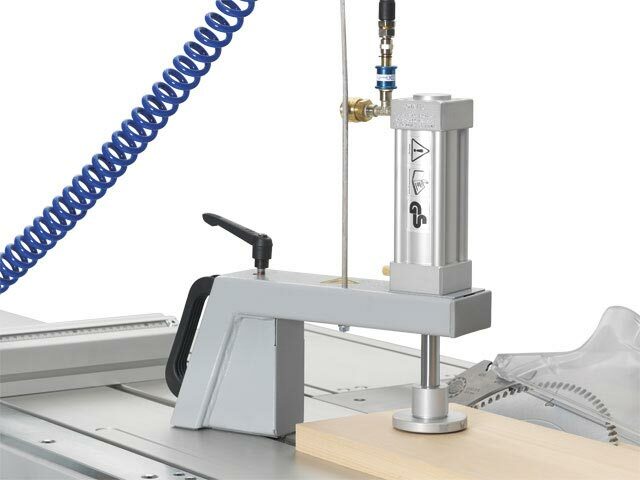 The rip fence is easily and smoothly adjustable, with a one-hand clamping mechanism. 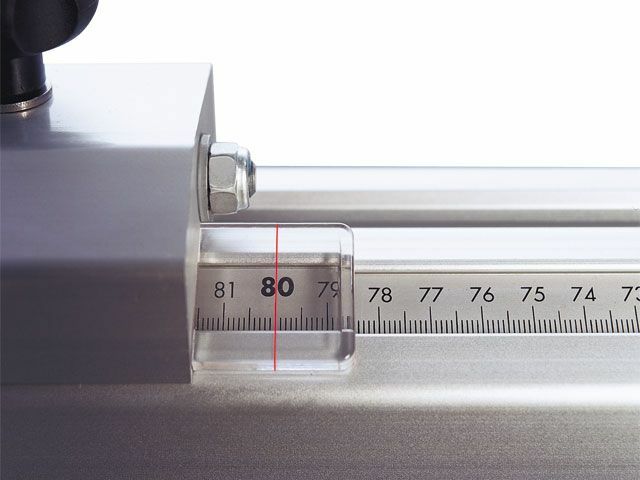 The fine adjustment mechanism allows for precise measurements. 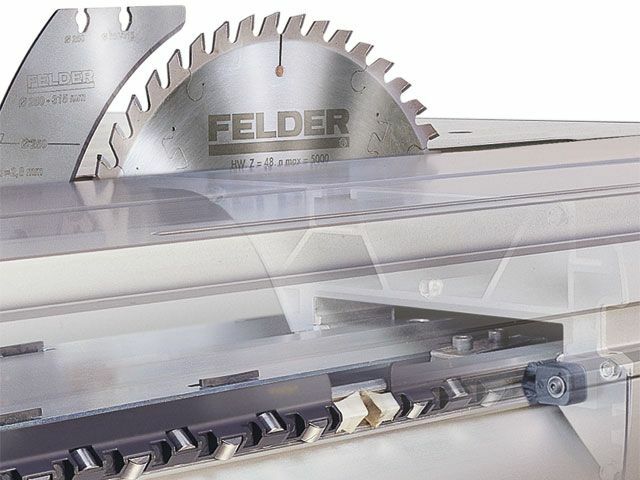 The electric motor positioned rip fence running on a maintanence free lineal guiding system with ball bearing bushings moves quickly and accurately to within a tenth of a millimeter of the entered cutting width. The rip fence can be tilted away at any point along the full rip length and guarantees perfect cuts with a maximum width of 49“ (1250 mm). 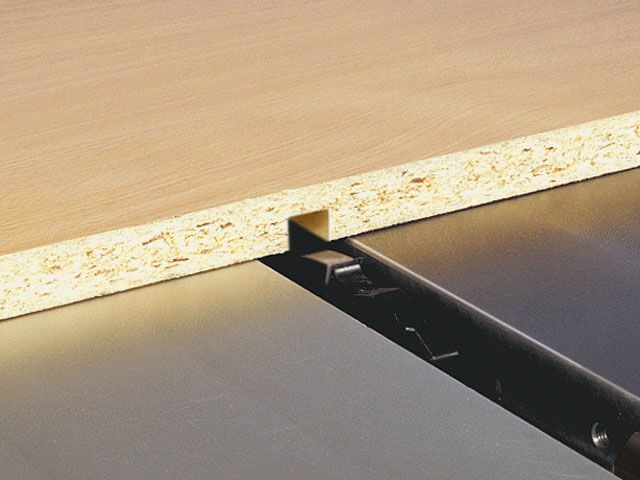 The operating panel provides you with all information relating to the rip fence, in real time. 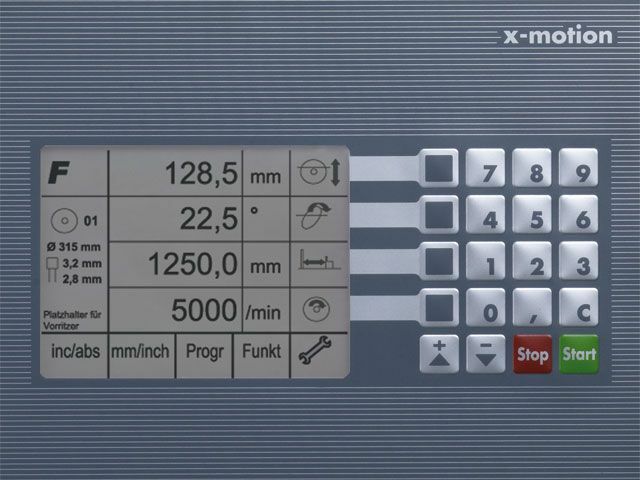 Quickly and easily you can enter the required value onto the operating panel, saving time and increasing your productivity. 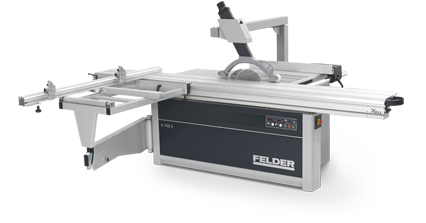 The integration of the electronic digital display on the rip fence allows for the reading of the cutting width to .004” (.1 mm). 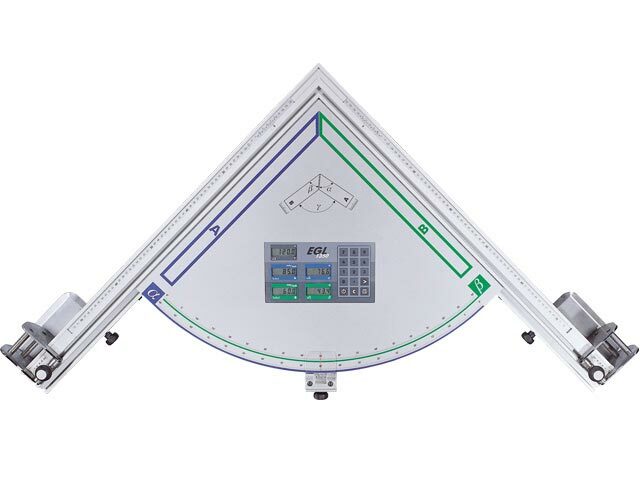 The display may be rotated up to 90° for easy reading from any working position. 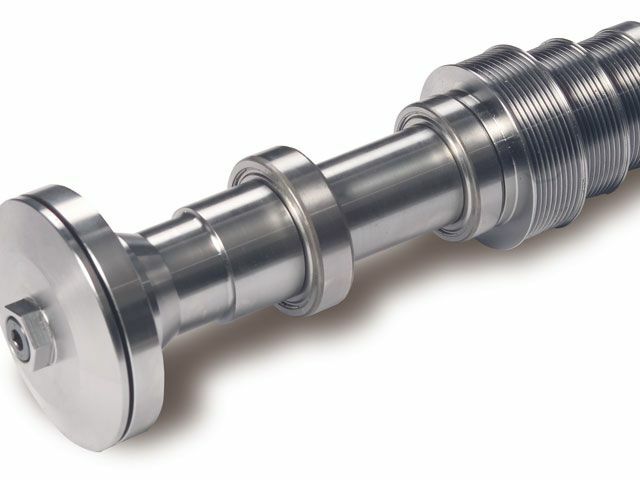 The fine adjustment knob allows for precise .004” cutting adjustments. 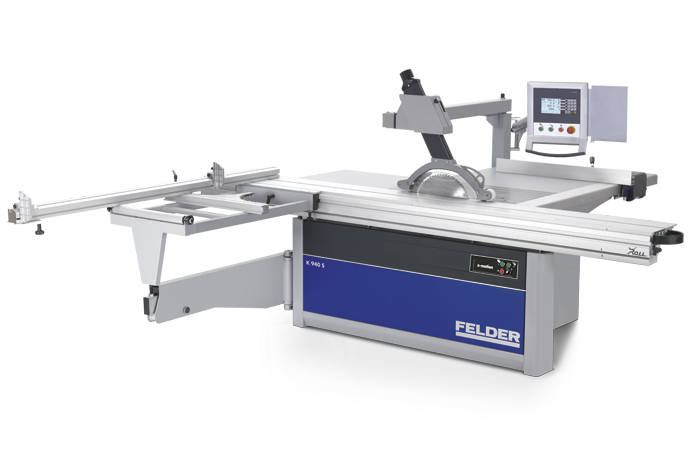 Rip capacity 31” (800 mm) with position control and readout from the control panel at eye level. 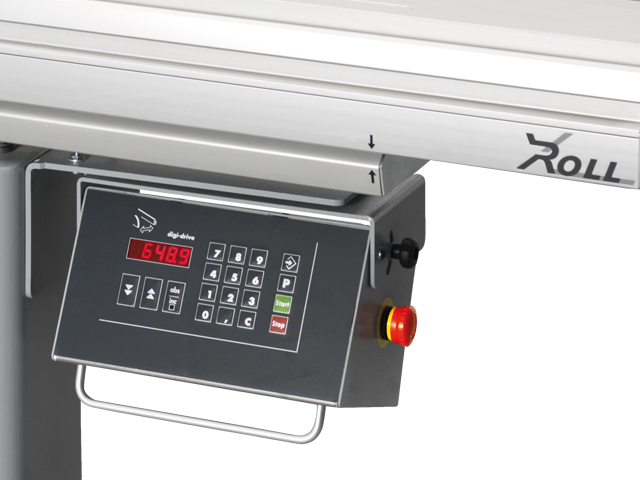 Rip capacity 49” (1250 mm) with position control and readout from the control panel at eye level.